Many people treat their tax refund like a mini lottery win. This tax time, consider putting your “gift” from the ATO to good use. Perhaps it’s the modern world we find ourselves in that leads taxpayers to look at their tax refund like it’s a fortuitous windfall gain. But if you look at your refund like it’s a chance to get on top of your financial responsibilities, its potential usefulness increases many times. When your refund arrives this tax season, plan to put it to work and tame the part of you that wants to fritter it away on things that don’t add long term value to your life. Put it into your superannuation account – Remember that when you reach 70 years of age you get better tax treatment. Unless you’re already contributing the maximum to your super through a salary sacrifice arrangement, there won’t be many other opportunities to do some tomorrow proofing. Reduce or pay off your Help debt – The ATO keeps track of your HELP debt balance and allows you to pay it off as you go. If your salary is over the HELP repayment threshold (currently $54,868) HELP repayments are levied from your before-tax income automatically, with the rate starting at 4% and rising as your pay increases. For now, if you pay your HELP debt upfront, the government reduces your debt by a further 10%, with a 5% reduction on offer for repayment contributions that are in addition to the compulsory amounts. But this offer runs out on January 1, 2017 — so this is the last tax refund that you can use to get this “free money” offer. Grab this chance to have some smart money; money put away in a just-in-case account. 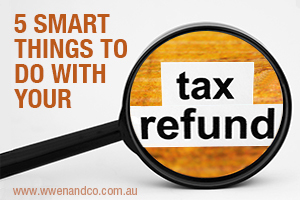 Most Australian banks offer higher-interest savings accounts, and while some require minimum monthly deposits, you can’t go wrong letting your tax refund earn some extra returns for a short time. It’s a rare luxury to be able to pay any insurances, registrations and repayment obligations before they are due. Car registration payments commonly catch people off-guard, and paying extra off your mortgage will save interest on daily compounding rates. Bite the bullet – defer those luxuries for now and buy them next quarter when your bills are fully taken care of. Business tools and resources inevitably age. Why not use your tax refund to update old equipment or replace not-so-good assets with good ones? If you’re a small business owner, anything you buy for your business use is likely be able to be written off, so you’ve got an extra incentive to use your tax refund this way. Having a better financial destiny is an age-old goal which takes discipline to achieve and this year’s tax refund is a chance for you to take some steps in the right direction.